(tră-pee -zee-ŭm) A very young open cluster of stars, protostars, gas, and dust that lies in the Orion nebula and is part of the Orion association. There are four prominent young main-sequence stars, which form the multiple star θ1 Orionis and are of spectral class O6, B1, B1, and B3. These stars excite and ionize the nebula. They form a trapezium and are visible with a small telescope. the multiple star θ1 Orionis, located in the middle part of the Great Nebula of Orion. The star has nine known components, the four brightest of which (A, B, C, and D in Figure 1) form the vertices of a trapezium. 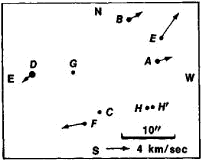 In 1949, V. A. Ambartsumian discovered a number of similar stellar systems, in which the distances between components are of the same order of magnitude. Such systems came to be called Trapezium-type multiple stars. The periodic orbital motions observed in ordinary multiple stars are unlikely in Trapezium systems; consequently, such systems should be regarded as unstable and in the process of breaking up. According to Ambartsumian’s determinations, Trapezium systems break up in a few million years. It follows that such systems observed at the present time cannot be older than a few million years and are therefore young formations. A considerable number of Trapezium-type multiple stars are found in stellar associations. A quadrilateral where no sides are parallel. Four very hot stars that appear to the eye as a single star in the Great Nebula of Orion; the star symbol is M42. It took 5 hours at his 18-inch reflector at 450x to capture just the area surrounding the four bright stars that make up the Trapezium cluster. Both the trapezium fracture treated had excellent functional outcome. The capsule was then subperiosteally elevated off the trapezium and the trapezium was removed. The AP radiograph reveals disruption of the continuation of arc I between the proximal border of the triquetrum and the proximal border of the trapezium, with the trapezium displaced in a radial direction (Figure 1). An inclusive definition for a trapezium is a shape with one pair of parallel sides. I get a strongly three-dimensional impression when looking down into the Trapezium region itself, unlike the flat appearance of even the best photographs. This activity was intended to generate some dissonance as teachers recognised that there were two definitions of trapezium and also to hone in on characteristics of "good" definitions. Additionally, for R&D applications with complex control and data analysis requirements, Shimadzu's TRAPEZIUM X software can be included. There's an amazing choice from the easy-to-fly butterfly or bat kites to the more ambitious box or trapezium kites. 2], then the figure having consecutive sides aC, cB, bC, cA is a Cylic quadrilateral called Brahmagupta trapezium with rational areas and diagonals while the diagonals are perpendicular to each other (Eves, 1976). If U, V are arbitrary free finite points then SFIP can transform a universal parallelogram into a trapezium (by swapping the points [V.
Probably the most photographed object in the Northern sky, spectacular in large telescopes, small telescopes will show detail in the Nebula and the Trapezium stars in the centre that illuminate it from within.